Whether you are flowcharting software programs or business processes, using only these structures will make it easier to find and correct errors in your charts. Each structure has a simple flow of control with one input and one output. These structures can then be nested within each other. Any chart can be drawn using only these structures. 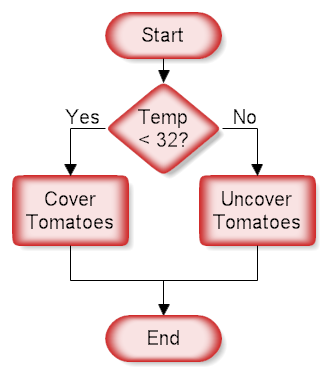 You do not have to use GOTO or draw spaghetti diagrams just because you are drawing a flowchart. 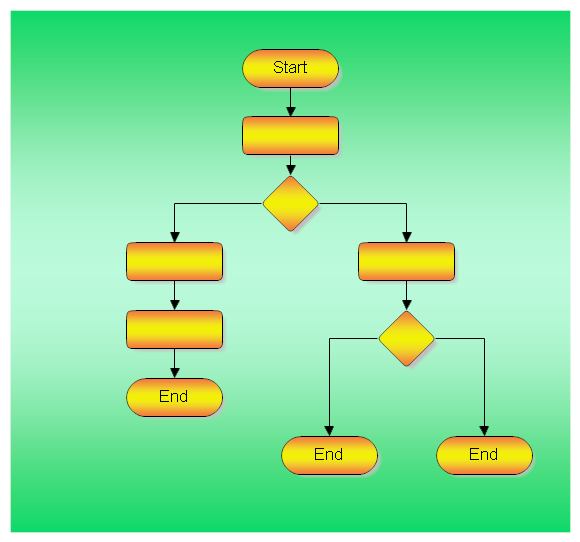 You can draw structured flowcharts. The Colored Edge Shapes Stencil The samples shown below were all drawn using RFFlow. If you don't have RFFlow installed, you can download the free trial version. It will allow you to draw charts just like these. Once RFFlow is installed, run RFFlow and click on the More Shapes button. Sequence To download this chart, click flowchart_structure_sequence.flo. RFFlow allows you to number your shapes if you wish. Run RFFlow and click on Tools, Number Shapes, and put a check mark in Enable numbers for the entire chart. You can also choose to have a number or not in each individual shape and you can quickly renumber your chart at any time. 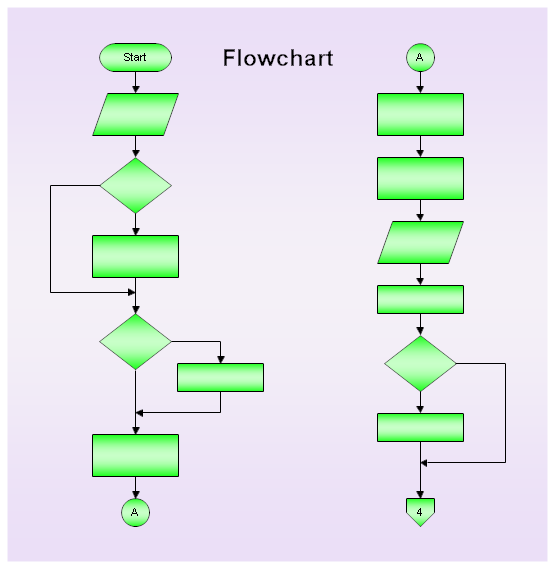 Decision To download this chart, click flowchart_structure_decision.flo. This structure is called a decision, "If Then.. Else" or a conditional. A question is asked in the decision shape. Depending on the answer the control follows either of two paths. In the chart above, if the temperature is going to be less than freezing (32 degrees Fahrenheit) the tomatoes should be covered. Most RFFlow stencils include the words "Yes" and "No" so you can just drag them onto your chart. "True" and "False" are also included in most of the flowcharting stencils. To download this chart, click flowchart_structure_loop.flo. This structure allows you to repeat a task over and over. 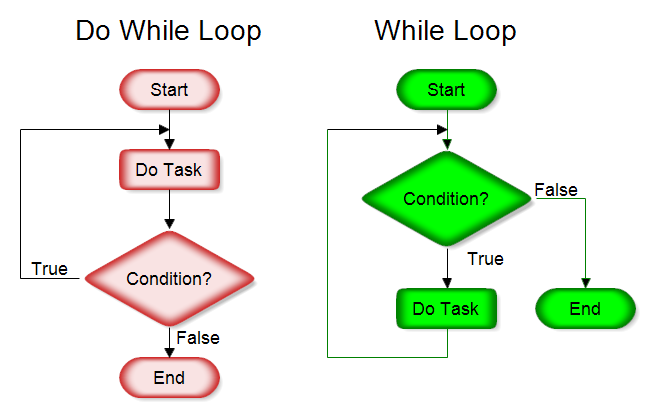 The red chart above on the left does the task and repeats doing the task until the condition is false. It always does the task at least once. The green chart on the right checks the condition first and continues doing the task while the condition is true. In the green chart the task may not be done at all. You can also have the conditions reversed and your loop is still a structured design loop. To download this chart, click flowchart_structure_for_loop.flo. The above chart is a "For Loop." 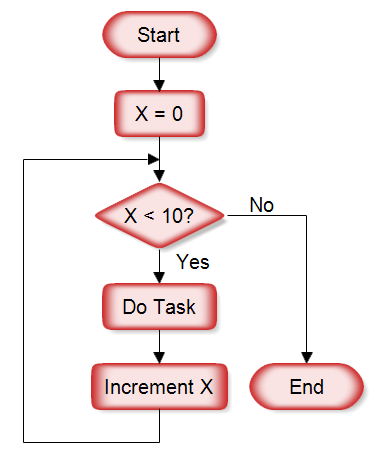 In this example the task is performed 10 times as X counts from 0 to 10. Depending on the condition, the task may not be performed at all. There is also a "For Each" structure that is like the for loop, but has no counter. It will go through each item of a collection and do the task. You don't have to know the length of the collection or use a counter. It is essentially saying "do this for every item in the collection". To download this chart, click flowchart_structure_case.flo. The structure above is called the case structure or selection structure. The decision works fine if you have only two outputs, but if there are several, then using multiple decisions makes the chart too busy. Since the case structure can be constructed using the decision structure, it is superfluous, but useful. 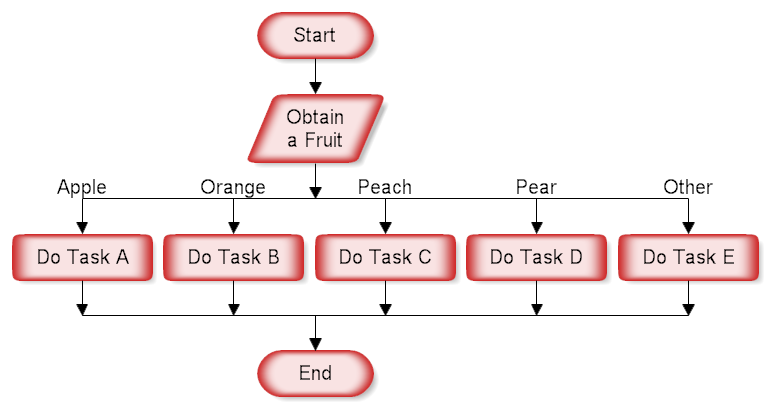 The case structure helps make a flowchart more readable and saves space on the paper. 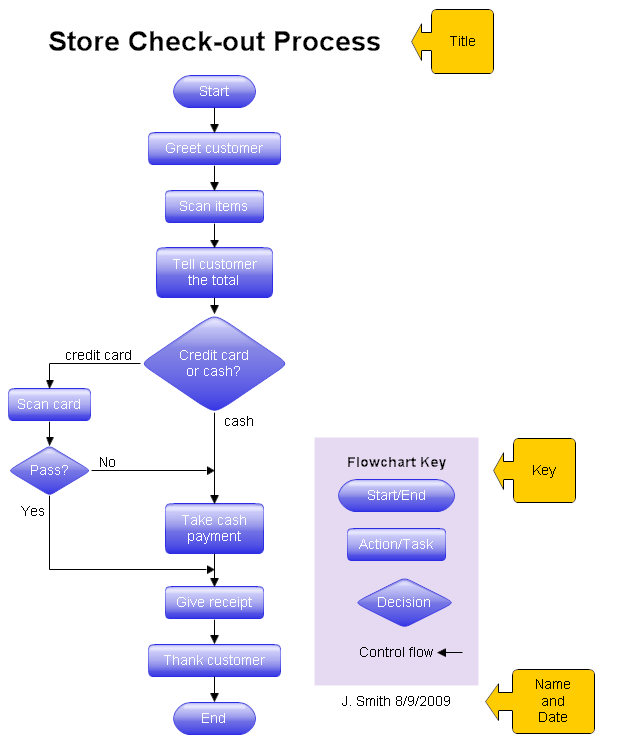 To download this chart, click flowchart_start_end.flo. Each flowchart must have one starting point. It can have multiple ending points, but only one starting point. The same terminal shape is used for the start and end. The terminal shape is a rectangle that is semicircular on the left and right as shown above. You can use other words instead of start and end, like begin and finish, or any words with a similar meaning. Some companies use an oval instead of a terminal shape. The bottom line is that it should be clear to the person looking at the chart where the chart starts and where it ends. To download this chart, click flowchart_off_page_connector.flo. If you have to break up a chart, you can use a connector block symbol which is a circle. In the chart above there is a circle with the letter "A" at the bottom left of the chart. This signifies that control should be transferred to another point on the chart that has a circle with the letter "A." That point is located at the upper right corner of the chart. Using connectors allows you to fit charts to the paper more easily. The circle can be used to reference a point on the same page or on another page. You can also use the off page connector shape shown below. The circle and the off page connector are equivalent. Inside the circle you can use either letters or numbers. For off page references you should use the page number. A good flowchart should have a title, either on the chart or in the text of the document. It is sometimes helpful to include a key to the shapes, especially if you are using any non-standard shapes. Including the name of the author and date of last modification is also useful. These items are highlighted in the chart above. The above chart is a rough description of a retail store checkout process. The level of detail to use in a chart depends on the intended use of the chart. You may need a very detailed chart if you are trying to optimize each step in a process. Sometimes you may want to draw a general chart and do separate charts for each step. RFFlow allows you to create hyperlinks so you can click on a shape and jump to another chart. Click on this link to download the above chart flowchart_title_key.flo.